So many times I hear people say “We are all God’s children”. However this is not a true statement. The Bible says that we are God’s children by faith in Christ Jesus (Galatians 3:26). So if Galatians 3:26 (and other Bible verses) are true than we must concur that “We are NOT ALL God’s children”. Take a look at these KJV Bible verses about God’s children. Psalm 2:6–7 Yet have I set my king Upon my holy hill of Zion. I will declare the decree: The LORD hath said unto me, Thou art my Son; This day have I begotten thee. John 1:12–13 But as many as received him, to them gave he power to become the sons of God, even to them that believe on his name: Which were born, not of blood, nor of the will of the flesh, nor of the will of man, but of God. 2 Corinthians 6:18 And will be a Father unto you, and ye shall be my sons and daughters, saith the Lord Almighty. 1 John 3:1–2 Behold, what manner of love the Father hath bestowed upon us, that we should be called the sons of God: therefore the world knoweth us not, because it knew him not. Beloved, now are we the sons of God, and it doth not yet appear what we shall be: but we know that, when he shall appear, we shall be like him; for we shall see him as he is. Luke 20:34–36 And Jesus answering said unto them, The children of this world marry, and are given in marriage: But they which shall be accounted worthy to obtain that world, and the resurrection from the dead, neither marry, nor are given in marriage: Neither can they die any more: for they are equal unto the angels; and are the children of God, being the children of the resurrection. 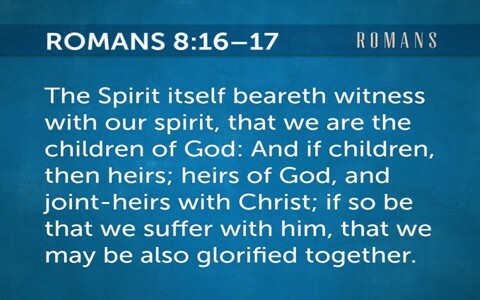 Romans 8:16–17 The Spirit itself beareth witness with our spirit, that we are the children of God: And if children, then heirs; heirs of God, and joint-heirs with Christ; if so be that we suffer with him, that we may be also glorified together. Romans 9:6–8 Not as though the word of God hath taken none effect. For they are not all Israel, which are of Israel: Neither, because they are the seed of Abraham, are they all children: but, In Isaac shall thy seed be called. That is, They which are the children of the flesh, these are not the children of God: but the children of the promise are counted for the seed. 1 Corinthians 3:9 For we are labourers together with God: ye are God’s husbandry, ye are God’s building. 1 Corinthians 12:26 And whether one member suffer, all the members suffer with it; or one member be honoured, all the members rejoice with it. Ephesians 2:19–22 Now therefore ye are no more strangers and foreigners, but fellowcitizens with the saints, and of the household of God; And are built upon the foundation of the apostles and prophets, Jesus Christ himself being the chief corner stone; In whom all the building fitly framed together groweth unto an holy temple in the Lord: In whom ye also are builded together for an habitation of God through the Spirit. 1 Timothy 3:15 But if I tarry long, that thou mayest know how thou oughtest to behave thyself in the house of God, which is the church of the living God, the pillar and ground of the truth. 1 Timothy 5:1–2 Rebuke not an elder, but intreat him as a father; and the younger men as brethren; The elder women as mothers; the younger as sisters, with all purity. I believe it is easy to confuse “We are all God’s creation” with “We are all God’s children”. Clearly the Bible teaches that to qualify as a child of God we must believe the truth of the gospel of our salvation (Eph 1:12-14). For it is only then that we are adopted by God to become joint heirs with Christ (Rom 8:17) and we cry “Abba, Father” (Rom 8:15). Take a look at this related article: Who Are the Children of God? Resource – Scripture quotations are from The Holy Bible, King James Version. Photo rendered from Logos Bible Software visual copy. Previous post: Was Jesus A Nazarite? Next post: How Can A Christian Glorify God At Work?